I agree, Hayden and Scott were fantastic. I suppose you could have guessed my opinion from the clips I posted above. Also, I am slightly biased, because George C. Scott is a distant cousin. 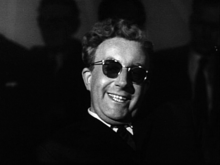 DR. STRANGELOVE is one of the best films I've seen. I always enjoy KUBRICK's films. All except for Eyes Wide Shut. I tried to give it a chance, but have never been able to make it to the end. All other Kubrick films, however, are A+ as far as I'm concerned, and yes, I'm one of those guys who likes all of Full Metal Jacket, not just the first half. I found this on YouTube and am finding it more hilarous then it has any right to be be so I thought I'd share it. I'm thinking of getting this on bluray and was wondering if anyone could tell me if all the extras, if there are any, are worth it? The scary thing is, Ripper was right about the plot to sap and impurify our precious bodily fluids with flouride..